Musculoskeletal complaints are frequent and have large consequences for public health. Information about the prognosis after presentation in general practice is far from complete. Knowledge about determinants of the clinical course of musculoskeletal complaints is essential for management decisions and to inform patients about their prognosis. The purpose of this study is to provide information about the prognosis of musculoskeletal complaints other than low back pain by studying the course of these complaints in general practice and to identify determinants of this course. Patients of 18 years and older, who present in general practice with a new episode of a musculoskeletal complaint of the neck, shoulder, elbow, wrist, hand, arm, hip, knee, ankle or foot, are recruited by their general practitioner (GP). Participants will receive complaint-specific questionnaires by mail at baseline and after 3, 6, 12 and 18 months. The following putative determinants of the course of the complaints will be investigated: sociodemographic characteristics, characteristics of the complaint, psychosocial job characteristics, physical workload, physical activity during leisure time, pain coping, mood, kinesiophobia, social support, optimism. The primary outcomes are perceived recovery, pain, functional status, sick leave and overall quality of life. Musculoskeletal complaints are a frequent health problem. The point prevalence among adults in the general population in the Netherlands is estimated at 45%. In the Netherlands, every year 109 patients per 1000 persons visit their general practitioner (GP) with a new episode of musculoskeletal complaints . Musculoskeletal complaints have great consequences for public health, because of their strong impact on functional disability, health care costs, sick leave and work disability. In the Netherlands, almost 26% of the functional disability in the population can be attributed to musculoskeletal disease . About 6% of the total healthcare costs are spent on musculoskeletal problems . In Sweden and Great Britain 30% of all sick-leave days and work disability are due to musculoskeletal problems [5, 6]. In Dutch public health care, the GP serves as a filter, as all referrals to specialists, physiotherapists and most other health care providers need confirmation by a GP. This implies that the GP has to distinguish complaints with need of specialist care from those that can be managed in primary care. Such decisions require information about the risk of developing chronic pain and disability in relevant subgroups of patients. However, information about the determinants of the prognosis of musculoskeletal complaints, which is necessary to inform patients, and to decide on content of care and referrals, is far from complete. The course of low back pain has already received much attention, and has been studied thoroughly [7–11]. Therefore, low back pain has been excluded from this study. Little information is available about determinants that influence the course after presentation in primary care of almost all other musculoskeletal complaints. Studies on prognosis are mostly performed in specific populations; for example in a specific group of employees [12, 13]. or patients attending specialist care . These results are not applicable in general practice . From the limited amount of available evidence a few putative determinants of the course of musculoskeletal complaints can be derived, including severity and duration of the complaint, and some intra-individual factors and extra-individual (environmental) factors [13, 15, 16]. More severe pain and previous neck pain were associated with a worse prognosis of neck pain in the study of Borghouts et al. Ariëns et al  reported a positive association between neck pain and the following work-related physical risk factors: neck flexion, arm force, arm posture, duration of sitting, twisting or bending of the trunk, hand-arm vibration and workplace design. Windt et al. observed that a high risk of persistent or recurrent shoulder complaints was found for patients with concomitant neck pain and severe pain during the day. In the study of Jørgensen et al. psychological distress acted as a determinant of physical health change, sick leave and patient self-rated improvement in patients with musculoskeletal illness. Macfarlane et al. reported disability as a determinant of continuing symptoms of shoulder pain. Avoiding physical activity had a negative effect on long-term functional status in early rheumatoid arthritis according to Evers et al. and Lankveld et al. Psychosocial variables, such as depressive symptoms or inadequate pain behavior, have not often been taken into account, although these factors have been shown to be related to a high risk of chronicity in low back pain . So far, the majority of research has evaluated the prognostic value of clinical characteristics (symptoms and signs), whereas little attention has been given to the potential prognostic value of psychosocial and occupational factors. 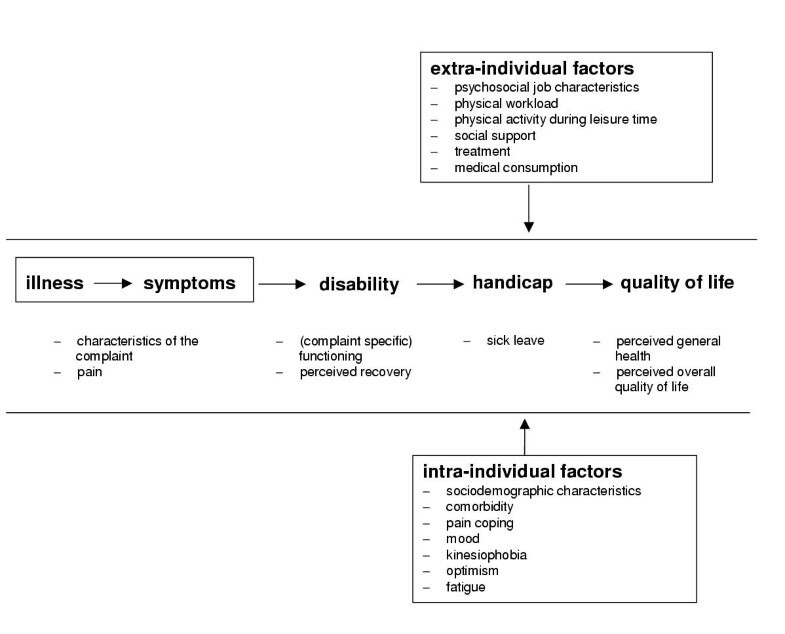 We used the "disablement process" of Verbrugge  as a framework for studying determinants and outcomes in the present study (Figure 1). This conceptual model describes how chronic and acute conditions affect functioning in specific body systems, fundamental physical and mental actions, and activities of daily life. Furthermore, it describes the intra-individual and extra-individual factors that may influence functioning. The purpose of this study is to provide knowledge about the course of musculoskeletal complaints other than low back pain in general practice and to identify determinants of this course. The study is designed as an observational prospective cohort study in general practice. At baseline and after 3, 6, 12 and 18 months of follow-up, individual patient data are collected by means of self-administered questionnaires. The Medical Ethics Committee of the VU University Medical Center approved the study protocol. Patients are eligible for participation in the study if they meet the following inclusion criteria: patients who visit their general practitioner with a new complaint or new episode of complaint of the neck, shoulder, elbow, wrist, hand, arm, hip, knee, ankle or foot; 18 years or above and capable of filling in Dutch questionnaires. An episode of complaint is considered 'new' if patients have not visited their GP for the same complaint during the preceding 3 months. Patients are excluded from the study if a fracture, malignancy, prosthesis, amputation or congenital defect causes the presented complaint and if patients are pregnant. Patients can be included in the study only once. The study is embedded in the 2nd Dutch National Survey of General Practice (NS2), carried out by the Netherlands Institute of Primary Health Care (NIVEL) . A number of 200 GPs from 104 practices participate in the NS2. A total of 52 GPs (from 29 practices), who started first with the NS2, participate in our study. These GPs all use ICPC codes (International Classification of Primary Care) to classify the main complaint of each patient at each consultation. A selection of ICPC codes was made to identify patients with musculoskeletal complaints (Table 1). When the GP enters one of these ICPC codes into the computer during the consultation, a pop-up screen appears with a reminder of our study. The GP has a card available with the selection criteria in the office. Patients who are eligible for participation are informed about the study by their GP. If they show interest, they receive a brochure about the study. Subsequently, they fill in a preliminary consent form in which they allow their name and address to be released to the investigators, and indicate the location of their complaint on a manikin. In addition, patients are asked to select one of 3 categories that best represented their complaint: neck/upper extremity, hip/knee or foot/ankle. Patients with generalized pain or pain in multiple locations are asked to indicate at which location the complaints are most severe or most troublesome, and were reason to consult their GP. Finally, this preliminary consent form is faxed to the investigators. When the pop-up screen appears, the GP indicates if the patient has been given a brochure, meets the selection criteria, and has given preliminary consent. With this information, we gain insight into the non-response and the external validity of our findings. Each GP includes patients during a period of 3 months. If this procedure does not result in a sufficiently large number of participants (see below), the GPs will be asked to extend the inclusion period. Furthermore, additional GPs will be recruited outside the setting of NS2. These additional GPs will follow the same inclusion procedure, although the supporting NS2 software, which includes the pop-up reminder screen, is not available to these GPs. After receiving a preliminary consent form, the investigators send additional information about the study and a final consent form to the patient. Also the baseline questionnaire is included in this package. Patients who are unwilling to participate are asked to return a non-response card. In order to increase the response rate, participants who have not returned the questionnaire within 10 days are contacted by telephone. Patients, who return an incomplete questionnaire, are contacted to complete the questionnaire by telephone interview. In addition, small incentives (coffee, tea and candies) are presented to the participants. Depending on the complaint marked on the fax, patients receive a complaint-specific questionnaire. Three different kinds of questionnaires have been developed: questionnaires for 1) complaints of the neck and upper extremities, 2) complaints of the hip or knee, 3) complaints of the ankle or foot. Based on the model of Verbrugge and information derived from preceding studies, the influence of the following intra-individual determinants on the course of the complaints will be investigated: sociodemographic characteristics, characteristics of the complaint, comorbidity, pain coping, mood, kinesiophobia and optimism. The following extra-individual determinants will be investigated: psychosocial job characteristics, physical workload, physical activity during leisure time and social support. The content of the questionnaires is shown in Table 2. The questionnaires will be sent at baseline (approximately 16 pages) and after 3, 6, 12 and 18 months (approximately 8 pages) and contain the following outcome measures: at the level of symptoms, pain is scored on an 11-point numerical rating scale. At the level of disability, functioning is measured with complaint specific questionnaires (Table 2) and subscales of the Medical Outcomes Study 36-item Short Form Health Survey (SF-36): physical role-functioning, emotional role-functioning, after 6, 12 and 18 months of follow-up and the complete SF-36 after 3 months of follow-up. Perceived recovery is scored by the patient on a 6-point rating scale. At the level of handicap, sick leave is measured. At the level of quality of life, perceived general health (subscale of the SF-36) is measured. Overall quality of life is measured on a 5-point rating scale, based on the format of the first question of the perceived general health subscale of the SF-36. In contrast to hip or knee complaints (WOMAC) or foot problems (Foot Function Index), an upper extremity disability scale, suitable for our study, is not available in Dutch. We considered it important to assess and analyze upper extremity function as one unit (kinetic chain ). Therefore, we decided against using several joint-specific questionnaires, and derived a new scale from two existing, validated questionnaires [28, 29]. The face validity of our scale is satisfactory, and other clinimetric properties (internal consistency, validity and responsiveness) will be analyzed within the framework of our cohort study. There are no straightforward rules for computing sample size for observational studies. A guideline that is often being used advises at least 10 patients per determinant. The expected proportion of patients in each category of complaint (according to localization of complaint) is based on the incidence of these complaints in Dutch general practice . Based on these data we expect that patients with hip complaints will comprise the smallest category (5,1%). Participation of 2000 consecutive consulting patients should be sufficient to include 100 patients with hip complaints, which enables the construction of a predictive model for hip complaints that includes 10 predictors. The analysis will initially be conducted separately for different categories of complaints. Three categories of complaints will be made according to localization of the complaint as indicated by the patient questionnaire; 1) complaints of the neck and upper extremities, 2) complaints of the hip or knee, 3) complaints of the ankle or foot. In each category, traumatic (according to ICPC code or cause of the complaint, indicated by the patient as 'accident') vs. non-traumatic, chronic (i.e. symptom duration at least 3 months) versus acute and elderly (65+ years) vs. non-elderly, will be compared. The course of the complaints will be described by means of descriptive statistics. Determinants that influence the course will be determined by means of (logistic) regression analysis and analysis for repeated measurements over time (Generalized Estimating Equations). Outcome measures will be analyzed separately in different multiple regression analyses. Correlations between potential determinants will be calculated with Pearson or Spearman correlation coefficients. In the case of high correlation between 2 determinants only the most predictive determinant in the univariate analyses will be included in the multiple regression models. The NS2 will provide additional information about all patients who are eligible for the study. This information covers ICPC code, medical consumption and co-morbidity during the 12 months in which the GP participates in the NS2. The information is available for participants of the study as well as for eligible patients who refused to participate. This information will be used to analyze if the group of participants is a good representation of the source population of eligible patients. Furthermore, the information will be used to calculate yearly incidences of all categories of complaints in general practice. This protocol describes an observational prospective cohort study on the determinants of the course of musculoskeletal complaints in general practice. The results will give GPs indications for optimal treatment and referral. Based on the results of this study, priority can be given to the development and evaluation of intervention strategies in general practice, including medical interventions, ergonomic advice or cognitive-behavioral interventions. Furthermore, the study can contribute to existing Dutch clinical guidelines for General Practice. The intended size of the study population is sufficiently large and the follow-up period is long enough to describe the influence of at least 10 determinants per diagnostic group on the course of complaints over 3 to 18 months. The results of this study will be presented as soon as they are available. This study is financially supported by the Dutch Arthritis Association.